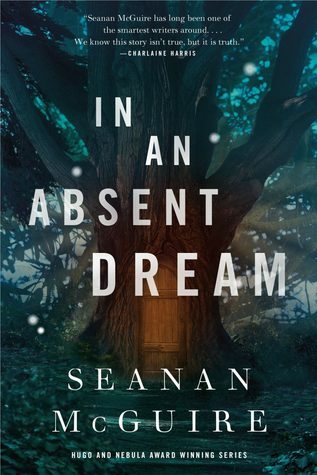 I received an arc of In an Absent Dream by Seanan McGuire from Tor Publishing in exchange for an honest review. I have been head over heels for The Wayward Children books for a long time now so I was very excited to share my love for this one! I also loved doing a buddy read with Caidyn, we had very different ideas so check out his post! Keep reading to see why I gave Absent Dream a 5-star review! For the uninitiated, The Wayward Children books follow a large group of individuals who have experiences with portal worlds. They examine questions like, what happened to Alice after she returned from Wonderland? One of the major themes is that each portal world has a way of finding the people that are meant to be there. It takes a certain type of person to thrive in worlds built of candy, or full of goblins. Some worlds seek out people to hurt them, rather than help. In an Absent Dream follows the experience of Lundy who finds herself in the goblin market. The book follows her experiences from a young girl to age 18. Her story is pretty unique among the Wayward Children stories. Lindy’s story is really focused on her choice of whether or not to continue living in her portal world. Unlike some of the other characters in the world, the choice is really hers alone. The world of the goblin market is controlled by a strict set of rules. Chief among them is the law of fair value. Every item, every piece of clothing, or food is traded through these rules. Every being in the market is required to give fair value for any trade, and that includes trades of services or information. If you don’t do this you accrue a magical form of debt that you must repay. If you don’t well…you’ll have to read to find out what happens. This notion of fair value is something I found fascinating. We all place a personal value on goods, but everyone’s gauge for what is valuable depends on a vast number of variables. Finding fair value on a case by case basis forces you to know your community members well, and to understand their needs and wants. This could lead to a close-knit community where lots of people are given things they value highly. It could also lead to a supremely unfair community, where the goods people value highly are priced too high to afford. Throughout the course of the book, you get to know Lundy’s acquaintances in both the mortal world and the goblin market. Though these relationships are crucial to her tale, ultimately Lundy’s tale focuses on her. I felt she struggled a great deal to get close to others in a meaningful, and had a difficult time anticipating others’ emotional needs. Her search for fair value extends to the amount of time owed to her closest friends and family. Absent Dream forces you to ask if that value can be quantified. It asks you to consider what you should give to and expect from the world. More than any previous Wayward Children book, book 4 made me think. The previous books in this series have all felt a bit too short to me, but I think this one was just the right length. It presented some really unique ideas, and even though it does not have a happy ending (not really a spoiler, you learn this in book 1) I found that really true to the message of the goblin market. I do think In an Absent Dream will be a bit divisive for fans. It feels different in a lot of ways and while I loved it, it may be too much of a departure for other readers. If you love the previous Wayward Children books, don’t miss book 4! It comes out on January 8th 2019.